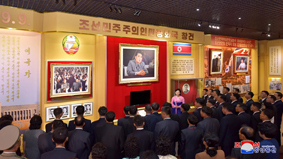 Delegates to the celebrations of the 70th birthday of the DPRK visited the Korean Revolution Museum on September 8. They paid tribute to the colored statues of President Kim Il Sung and Chairman Kim Jong Il in its general review room. Being briefed on the exploits of the peerlessly great men, they looked round several other rooms. Looking up at the statues and photos of Kim Il Sung and Kim Jong Il in the rooms dealing with the period of the anti-Japanese revolutionary struggle, the period of the arduous march and forced march, and the others, they got a profound idea of how the sagacious leaders had creditably carried out many historic tasks for building a powerful country in the era of independence. During their visit to the Victorious Fatherland Liberation War Museum they had a better understanding of the exploits the peerlessly great men had performed in safeguarding the dignity and sovereignty of the country, as well as the spirit of defending the leader unto death, the spirit of defending the country and the indomitable fighting spirit displayed by the soldiers in the 1950s.